To address the persistent underrepresentation of women and minorities in STEM fields, the National Science Foundation has issued a set of major awards through its INCLUDES initiative to scale up promising strategies with a national network of projects. INCLUDES is entering a new phase. 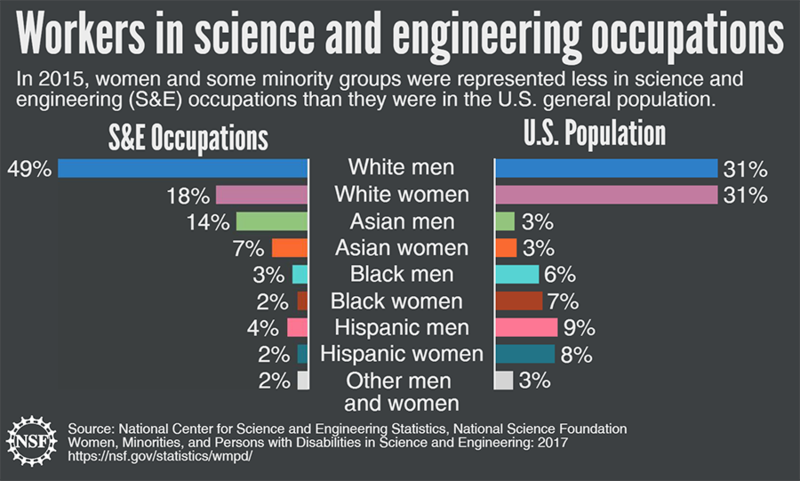 The National Science Foundation’s flagship initiative for increasing participation of underrepresented groups in STEM fields is aiming to establish a national network of programs that can scale up successful strategies for tackling longstanding workforce disparities. After funding dozens of pilot projects over the past two years, NSF recently issued six major awards to establish a set of partnership-based projects and a national “coordination hub” for the INCLUDES effort. 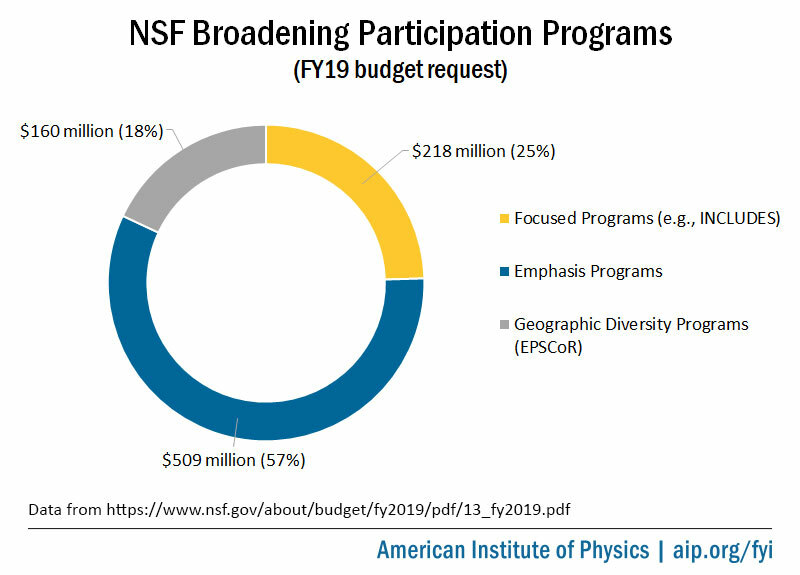 Going forward, NSF expects the initiative will become more connected with its other programs to broaden particiation in STEM and could collaborate with similar efforts already supported by other federal agencies. NSF Director France Córdova has said the agency is interested in expanding INCLUDES into a government-wide effort, pointing to the I-Corps entrepreneurship program as an example of how other agencies have used NSF programs as models in the past. In a report released earlier this year, Córdova explained that INCLUDES is the agency’s response to a 2013 recommendation by its Committee on Equal Opportunities in Science and Engineering to undertake a “bold new initiative” for broadening participation in STEM. Given the limited progress that had been made to date, the committee concluded such an initiative is needed to “move the needle” in cultivating a STEM workforce that reflects the diversity of the U.S. population. Despite decades of efforts, women, ethnic and racial minorities, and individuals with disabilities remain underrepresented in obtaining degrees and jobs in STEM fields. According to a 2017 NSF report, African Americans, Hispanics, Native Americans, and Alaska Indians together account about 31 percent of the U.S. population yet comprise 21 percent of science and engineering (S&E) bachelor’s degree recipients and 13 percent of S&E doctoral degree recipients. The report also observes that although women earn about half of all S&E degrees awarded, they constitute a smaller proportion of the S&E workforce than of the U.S. population. During the first phase of INCLUDES, NSF supported 70 two-year “Design and Development Launch Pilot” grants to projects that explored the causes of disparities in STEM fields and how to address them through innovative partnerships. Together, those projects involved over 750 organizations spanning the academic, public, and private sectors. The recently awarded grants will create “alliances” of partnerships to scale up successful outcomes from the pilot projects, share promising practices and data, and enhance collaboration. The coordinating hub will serve as the “backbone organization,” connecting the five new alliances into a national network. NSF awarded SRI International $10 million over five years to operate the hub. NSF plans to issue grants for additional alliances in the future, pending funding availability. The American Physical Society and American Astronomical Society, both AIP Member Societies, are partners on one of the initial alliance grants, alongside the American Chemical Society, American Geophysical Union, and Materials Research Society. They will establish the “Inclusive Graduate Education Network,” building on the successes of APS’ existing Bridge Program to increase graduate enrollment of women and underrepresented minorities in STEM fields. To achieve national impact, NSF INCLUDES shifts away from single-project efforts, and recognizes that complex problems are best addressed through collaborative approaches and shared resources among varying institutions, industry, and professional societies and the scientific community at-large. NSF officially launched INCLUDES in fiscal year 2016 and has made it one of its 10 “Big Ideas” for future investment. For fiscal year 2019, NSF requested $20 million for the program. INCLUDES is part of a large portfolio of programs at NSF focused on broadening participation (BP). The portfolio is divided into three categories: efforts explicitly focused on BP, such as the programs that are dedicated to funding research at minority-serving institutions; efforts that have BP as one of several emphases, such as research fellowship programs; and the Established Program to Stimulate Competitive Research (EPSCoR), which is dedicated to increasing the geographic diversity of institutions that receive NSF funds. These programs together received $927 million in fiscal year 2017 and NSF has requested $887 million for them in fiscal year 2019, with a quarter of the total going toward programs dedicated to BP. Sylvia James, acting deputy director of NSF’s Education and Human Resources Directorate told FYI that, in building out the INCLUDES network, the agency hopes to leverage its existing knowledge base. “We have invested significant funding over the years which has resulted in a robust broadening participation portfolio and we have made some progress,” she explained, “but we want to see what the effect is of really approaching broadening participation challenges from the perspective of scaling up strategies that are evidence-based approaches that have been tried over the course of several years in the [INCLUDES] pilots or longer in other programs.” She noted that many of the pilot projects build on the work of NSF’s other BP programs. James said NSF is discussing how to connect its other BP programs with INCLUDES. She noted the agency has developed several “on-ramps,” such as inserting language in funding solicitations that encourages programs to link to INCLUDES. NSF is also seeking ways to use INCLUDES as a catalyst to advance BP initiatives across public, private, and academic sectors. In September, NSF announced a $21 million partnership with Boeing that includes a $1 million contribution from the company to INCLUDES. James further noted that “there is a lot of interest on the part of federal agencies to continue conversations about ways to collaborate across agencies in addressing broadening participation challenges.” She said agency officials have discussed the possibility of forming a “network of networks.” NSF intends to invite agencies to attend a meeting of the INCLUDES national network community to continue discussions early next year.